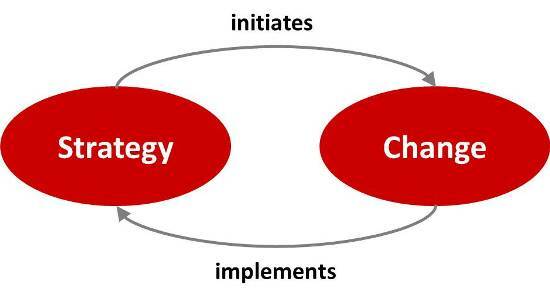 Strategy and change – are they the same? You are here: Home / Articles / Strategy and change – natural order or chicken-and-egg problem? At the first glance, it is common sense: at first, a strategy is developed. Then, change is necessary in order to implement that strategy. The logic of this order is striking, isn’t it? Unfortunately, life is not as simple as we would prefer. It would be shortsighted to see change only as a means of implementing strategy. There are many other facets in the interrelationship of strategy and change. Of course, change in organizations doesn’t come out of nowhere. Normally there is a need to change processes, systems, styles, culture or other aspects of the organizational design. 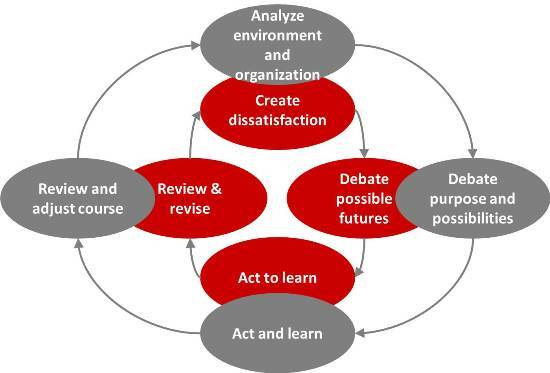 Change requires effort and moves (parts of) the organization out of its comfort zone. Therefore, we can assume that this need for change has a certain level of urgency and inevitability. An intended strategy change is such a cause for organizational change. Despite this regular cause-and-effect-relationship between strategy and change, there are some more aspects. Actually, change may even cause a shift in strategy. 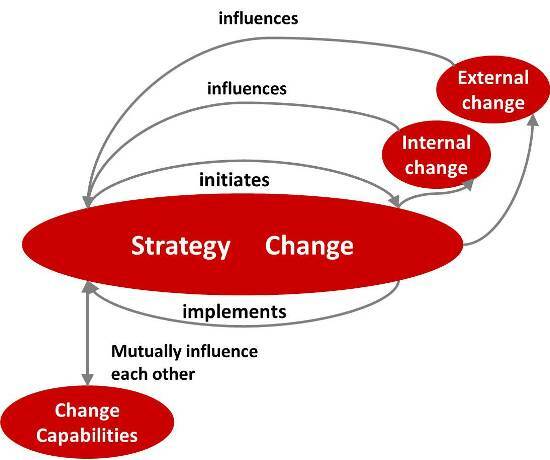 Here are some more aspects of the interaction of strategy and change. Organizations change over time, even without intention. Employees and managers come and go. With them, knowledge, experience, values and connections come and go. Similarly, organizational capabilities change due to technological progress. In the result, the original fit between an organizations capabilities and resources on one hand and its intended strategy on the other hand may fade away. The organization is ready for a new strategy to move on to the next level. An example for such an internal change is turnover in middle and top management. New managers bring new ideas. Although they initially operate within the given strategy, they will incrementally shift their focus to new opportunities they identify, propose new initiatives, and thus change the businesses direction. Sometimes, external forces virtually require the organization to change itself. This change, in turn, forces the organization to adjust its strategy. We can currently observe such an imposed change in the financial services industry, mainly in Europe. European authorities have been tightening regulation for banks and other financial services providers since the last financial crisis. They aim to improve the stability of financial markets and prevent abuse of the system. These changes will have a severe impact on the banks business models and their earnings capacity. Thus, they are forced to adjust their strategies accordingly. A typical reaction seen in many banks is a shift in focus from investment banking and capital markets activities to retail business. Other banks try to establish fee-based advisory services as a new revenue source. Not every organization can cope with every level of change. Hence, the best strategy is essentially worthless, if the organization is not able to implement it with the necessary change. It is an essential part of every strategy process to analyze all strategic options for their acceptability (to all major stakeholders) and their viability (has the organization the capabilities and resources to implement it). Which type and level of change will be required for this strategy? Has the company undergone this type of change before? With which results? Are there any change masters who can lead this change? Which is the organizations general attitude to change – are they reluctant or are they embracing change as a way forward? Is the organization ready for another change initiative or is it still struggling with the effects of the last initiative? Do the organizations change capabilities work best with incremental change or transformational change? Is it possible to quickly build the required capabilities and readiness for change? I acknowledge that it is not an option to abandon the most promising strategy, since the organization does not feel able to change accordingly. However, strategy is not only and objective. It also is the path to this final state. It may be worthwhile to reconcile the roadmap for strategy implementation and the organizational capabilities for a better fit. As long as strategy and change management are kept in different boxes, there will be a costly disconnect between them. But you can close the gap by thinking of strategy as change management.